Dezeen promotion: design brand Luminaire is presenting work by designers Tokujin Yoshioka, Patricia Urquiola and Daniel Widrig at an event in its exhibition space this Thursday evening, to coincide with Design Miami. The Design+World event will showcase products in Luminaire's range, including Yoshioka's Elements tables with surfaces balanced on angled supports. Spanish designer Patricia Urquiola's recently published Time to Make A Book compendium will be available alongside art and design titles by Phaidon. 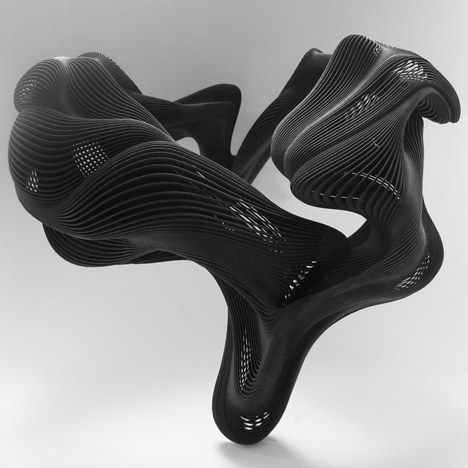 Sinuous 3D-printed body adornments by designer and architect Daniel Widrig will debut at the event. Widrig's Kinesis collection features undulating forms that wrap around the neck and over the shoulders, created using selective laser sintering. Other pieces on display will include blown-glass ornaments by Italian studio Fabrica and glass pendants that look like fishing floats by Nao Tamura, plus more glassware by a variety of designers. The event will take place from 6-9pm on Thursday 5 December 2013 at Luminaire Lab, 3901 NE 2nd Avenue, Miami, Florida - RSVP to attend here. Find out out more about the event on the Luminaire website. Luminaire's continued commitment to promoting good design and education culminate with the third instalment of Design+World, a comprehensive exhibition exploring how today's designers are interpreting materials, technologies and production methods to create work which expands on the traditional boundaries of design. The exhibition will include works by Tokujin Yoshioka, Patricia Urquiola and Daniel Widrig. As well as exploring the culture of glass with Fabrica's Drawing Glass, Nao Tamura's poetic glass lighting and a selection of limited edition glass pieces from our own collection. Additionally, we will welcome Phaidon books to the showroom, bringing a preeminent voice in art and design to the design district. We look forward to meeting you this year at Design+World, and experience how innovation and imagination unite to impact the future of design across the globe. Luminaire is thrilled to welcome London and Berlin-based designer, architect and artist Daniel Widrig to Design Miami and Art Basel Miami Beach 2013. As part of the installation, Design+World explores how today's designers interpret materials, technologies and production methods to create work that expands the boundaries of design. Widrig's lightweight and unique 3D-printed jewellery collection Kinesis complements the vision of this exhibition perfectly. The soft, undulating pieces embrace the neckline and shoulders as an exoskeleton. Kinesis pushes the limits of selective laser sintering (SLS), gracefully transforming digital systems into wearable landscapes so artful, avant-garde and surreal that it feels otherworldly. The expressive, sinuous movement of Kinesis and its architectural character are akin to his early work as an architect when alongside his mentor, Zaha Hadid, he led a number of award-winning architectural projects, products and other designs. Widrig graduate from the Architectural Association in London in 2006, and that same year started working with acclaimed architect Zaha Hadid. In 2009 he opened his own studio with a dedicated team of specialists in a broad range of fields including fashion, furniture, sculpture, stage design and architecture. Embracing digital systems since its early days, the studio holds a unique position in the field and is widely considered to be in the vanguard of digital art and design. In 2011 he worked with the fashion designer Iris Van Herpen to create an extraordinary series of 3D printed dresses, which was named one of the 50 Best Inventions of 2011 by Time Magazine.